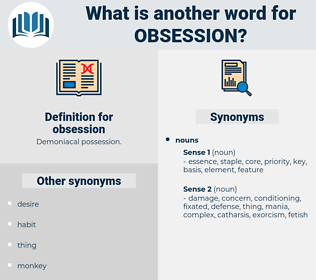 What is another word for obsession? insistence, addiction, fascination, persistence, tenacity. 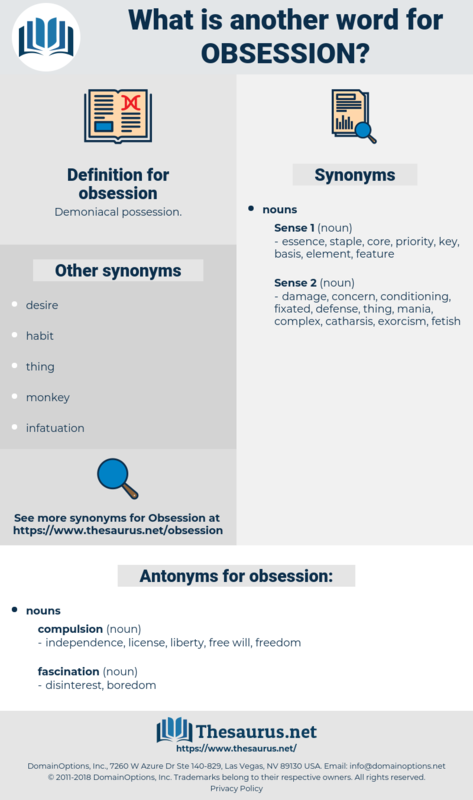 fixation, obsessive, passion, obstinacy, fetish, fantasy, craze, madness, concern. independence, license, liberty, free will, freedom. Passionate, impulsive, and often unreasonable, his mind was singularly well - balanced and never before had it succumbed to obsession. He went on: " It becomes, my dear, I assure you - the idea of that possibility becomes absolutely an obsession - even to a man usually quite his own master -" They were almost at a standstill now, and the two in front of them had reached the house.